Beebe Healthcare is proud to recognize Anna Whitney, a customer service liaison at Beebe Healthcare, as the March Living Our Values Every Day (L.O.V.E.) award recipient. 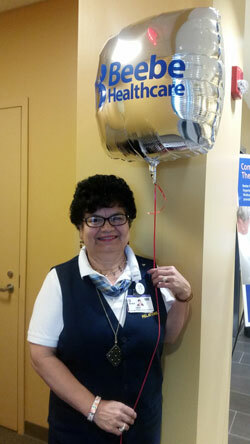 Anna Whitney works as a customer service liaison at the Georgetown Health Campus. Anna is often the first person patients meet as they enter the Georgetown facility, which houses Beebe Family Practice – Georgetown, Beebe Walk-In Care, Beebe Imaging, Lab Express, and Physical Rehabilitation, as well as Beebe HealthyBack. When Anna isn’t greeting patients with a warm smile, she is often found picking up trash in the parking lot or sweeping. Anna says she always want the building to look its best for the patients. For her compassion and caring, and her exceptional teamwork, Anna received the March L.O.V.E. Letter Award.